I had the pleasure of being asked by Melissa Techman, a guest-co-editor of the September/October 2014 edition of the Knowledge Quest journal, to write a piece about educator advocacy. My aim was to share some of the work that our Western Massachusetts Writing Project has done with regional teachers around getting published in local newspapers and to showcase practical advice on how to hone a message that is both positive and focused on supporting teachers in the classroom. 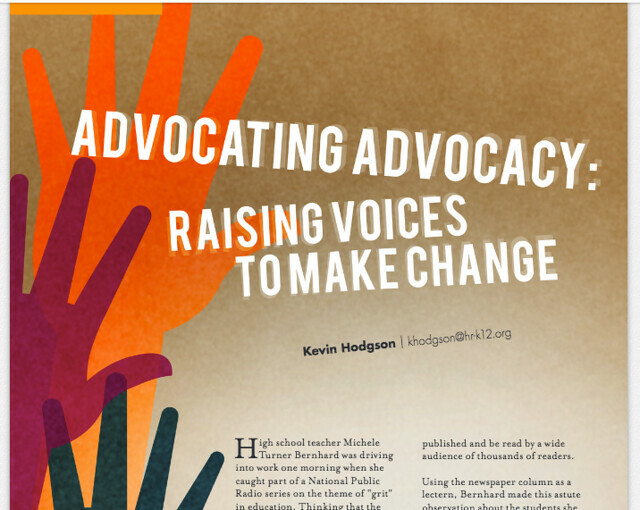 My piece — Advocating Advocacy: Raising Voices to Make Change — did not make it into the paper version of the Knowledge Quest magazine (darn, and we get it at home, too, as my wife is an administrator and a librarian) but the piece is available as an online exclusive for viewing and sharing. I owe a debt to my networking friends Steve Zemelman and Menoo Rami, who answered some of my questions about work they do to support educators in finding their voice through writing. And I need to give a a shout-out to a local teacher, Michele Turner Bernhard, for allowing me to use her story as a teacher-writer as my lead-in to the piece. You can find the article through the American Library Association website or just go here to the article itself, as pdf file. And it is always worth checking out Steve’s Teachers Speak Up website for what he has been up to. And for inspiration, read Menoo’s book, Thrive. Great article, Kevin. Too often teachers feel they are not heard.